Hyperloop will be better than flying, he says. Almost five years ago, Elon Musk suggested that passenger pods could zip through a vacuum tube at breakneck speeds. People — some high-profile investors, dozens of universities, and pretty much anybody that’s ever been stuck on a plane — went bananas for it. Hyperloop was born. Since then, we’ve come kind of a long way. In 2015, SpaceX built a mile-long test track; in 2016, MIT researchers unveiled a prototype of the pod and then demonstrated the first ever low-pressure run a year later. We’re finally getting to the point where the Hyperloop no longer seems like a pipe dream. An offshoot company wants to build a full line in Abu Dhabi in 2019, and one might connect Chicago and Cleveland. 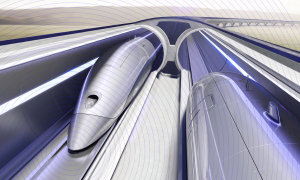 Now a number of businesses have sprung up around the concept of the Hyperloop. Since it was founded in 2013, Hyperloop Transportation Technologies (HTT) — the company that wants to connecting cities in the Middle East, like Dubai and Abu Dhabi, via Hyperloop — has grown to some 800 employees and raised tens of millions of dollars. He’s not a fan of public transport. Not a shocker coming from somebody who wants to revolutionize the way we travel. Class-based airline tickets are bad for society, and travelers deserve more for their money. Airport security is a demeaning charade. If you want to ride his Hyperloop, you’ll need to give up your biometric data. Because safety (or something). It will never cross a large body of water, and that’s a good thing. And the Hyperloop system will be really safe. Safer than any plane ride you’ve ever been on. Because it simply doesn’t make sense to hijack it? And if you don’t believe in the Hyperloop? Well you don’t exist.